The recent CONTAIN workshop at Valencia show-cased a wide range of new technologies aimed at increasing efficiency and security in container logistics operations. 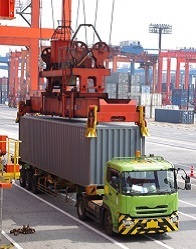 MJC² demonstrated its innovative real-time container scheduling solution which optimises multi-modal transport using live feeds from container tracking systems about the location and status of each container. The CONTAIN solution automatically interprets real-time tracking data while the container is on the road, comparing the actual activity against the plan. However, the most important aspect is that the system can also respond automatically to legitimate deviations from plan (e.g. traffic, delays, last minute orders), re-optimizing the logistics activity so that the operation is running as efficiently as possible at all times. Applications of this technology are extensive, not only within the container logistics industry but for many other supply chain operations which need to respond effectively to real-time events.